May's Full Moon is aptly named the "Flower Moon." And it pretty much has that name because of, well, pretty much what you are thinking right now...flowers are popping up everywhere. Grab some hippie garb, your bike, some lights and prepare to embrace your inner love child. If our weather holds we will take a little longer cruise to our destination...actually, even if the weather doesn't hold we will take a little longer cruise to our destination. FYI: It also happens to be Bike to Work/School Day. So, I am thinking you really don't have any excuses. Last Full Moon fell on tax day. 85 bikes collected at Eich's to ride. 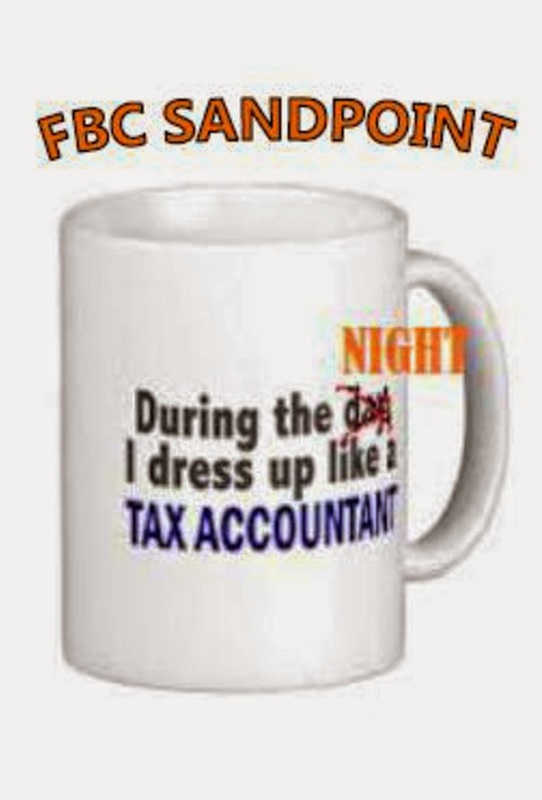 Some people dressed as their favorite...or not so favorite accountant...depending on how their taxes went. Anyways, the weather was awesome. The moon was out. We missed the Blood Moon as it happened the night before and was quite spectacular. We rode through West Sand. Along the way we had a FBC Sandpoint FIRST, FBC Lifetime Members for Life James and Julie used our little old ride to get engaged. Congrats to them. We ended at Huckleberry Lanes, that's a bowling alley in case you didn't know. They close at 9. We arrived at 9:30. Raymond and crew were ready for us and opened up the alley just for us. Big thanks to them and sorry about what happened to the restroom. FBC filled all the lanes and fun was had. FBC Lifetime Member for Life Marty appeared to be a closet bowling champ. I think he might hang out at the alley on the weekends when he says he is riding his bike. He bowled a high score of 295. As a comparison, I did not break 100 although I am sure I had way more fun them him. We all rolled out of there about 11:30. It was not all fun and games though, we bid farewell to a few members as life has called them to take their adventures to areas outside of Sandpoint. Good luck FBC Lifetime Members for Life Al, Jennie, Jake, Ang, Amy, Tyler and Jillian. It is summer, NOTE WE WILL MEET AT 8PM NOW UNTIL FURTHER NOTICE IN THE FALL. What are the odds? Well, I used to crunch numbers so I could actually tell you, but I will save you the boring details. This Full Moon falls on tax day. Now depending on the results of your tax return, you are either grumbling or rejoicing over your cash windfall. We won't get into the politics. Nonetheless, we will gather dressed like an accountant (it could be your favorite accountant or a voodoo doll that represents your accountant), ride our bikes under the full moon and well, have fun regardless of the day.